In my childhood Cawood parish had many farms and small holdings many of which were in the village itself. Some were owned by the occupiers but many were rented from the Prest Estate and others. At the beginning of the Second World War these farms were farmed in the same way that had been the norm for decades. Heavy horses were used for all the work on the land They were to be seen ploughing carting and hauling heavy loads from the fields to the farm yards. 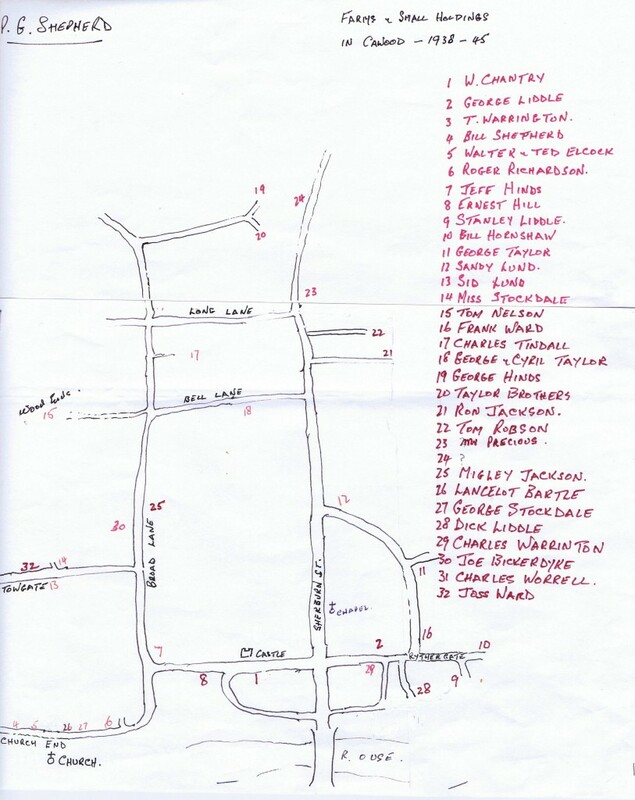 The fact that Cawood had so many farms in the village itself (19) is amazing. How did this effect village life? The roads at that time were much quieter. Only a few cars then: more likely to see horses walking to the fields often side by side with the farmer sitting sideways on one of them. Cattle passed through the village every day to pasture or back to the farm for milking driven by a man or boy with a dog and a stick. The animals soon got to know the way. At times a change of field caused them to stray into gardens and orchards with dire consequences. The farms brought work for many of the local people. Before the use of chemicals, all crops had to be hoed the keep the weeds from smothering the crops. Lots of casual work was available for spring harvest and autumn jobs. Today working on the farm can be lonely. Before mechanization it was very different. There were lots of fun and banter with others working with you. Harvest time was a very busy period. Sheaves of corn to be stooked and loaded on to wagons later. The horse drawn loads then taken to the farmyard for stacking and thatching. Once this was completed Mr. Sykes would visit the farms with his traction engine and threshing machine to separate the grain from the straw. About 11 men were needed for this operation. Some of the locals would go from farm to farm with the machine. I look back on these days with a sense of nostalgia. The hum of the machine, the smells the laughter and leg pulling from some of the men like Toby and Herbert weighing off wheat into 16 st sacks and carrying them into the barn was done by Herbert Moody and myself. When the stack got down to the last sheaves, the rats and mice would try to escape. Dogs and cats, boys with sticks and the farmer with his gun would attend to most of them. In the autumn many children picked potatoes on the farms for 7 shillings per week! The crop at this time was ploughed up “scrattin” took place. This meant uncovering many of the potatoes by hand. A man would empty the heavy baskets into the horse drawn cart. The potatoes would be then be tipped in the field where a long “pie “would be made and then covered with thick straw and soil.